Whew, I am barely getting this out on time. But I did want to do a post on it. I know a lot of others have done it as well. Ehh who cares. I have two kids who will be giving a gift each day this week. I've planned it all out and know what we'll be giving to them each day, so why not photograph while planning it right? Right! 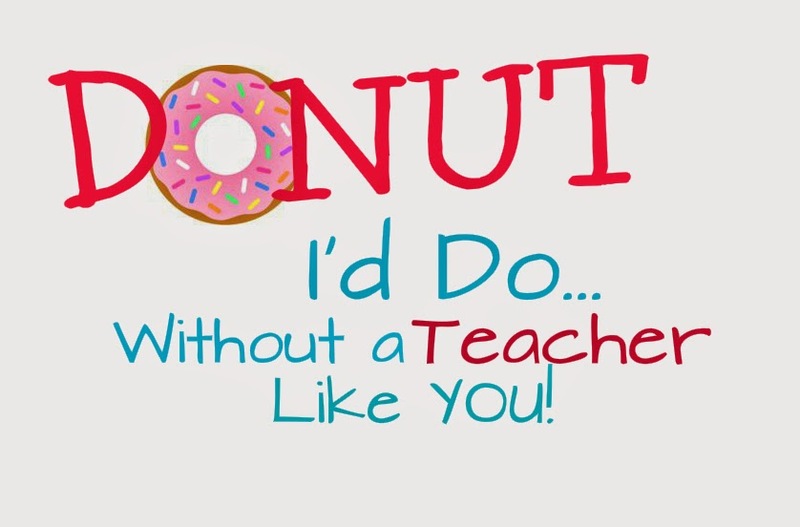 "Donut I'd do without a teacher like you"
on notebook paper and then added wax paper to the back side so that when I put the donut in it, it won't make grease marks. After making I cut the top with zig-zag scissors. Even though the sayings weren't mine, re-desined and made them all on my computer. I don't subscribe to Adobe so I can't do a PDF downloadable, but I will add the images to the bottom of the post. You should be able to just right click and save image as. I got the plastic tumblers at Walmart for only $6. Notice the logo? It says my name instead of Starbucks! 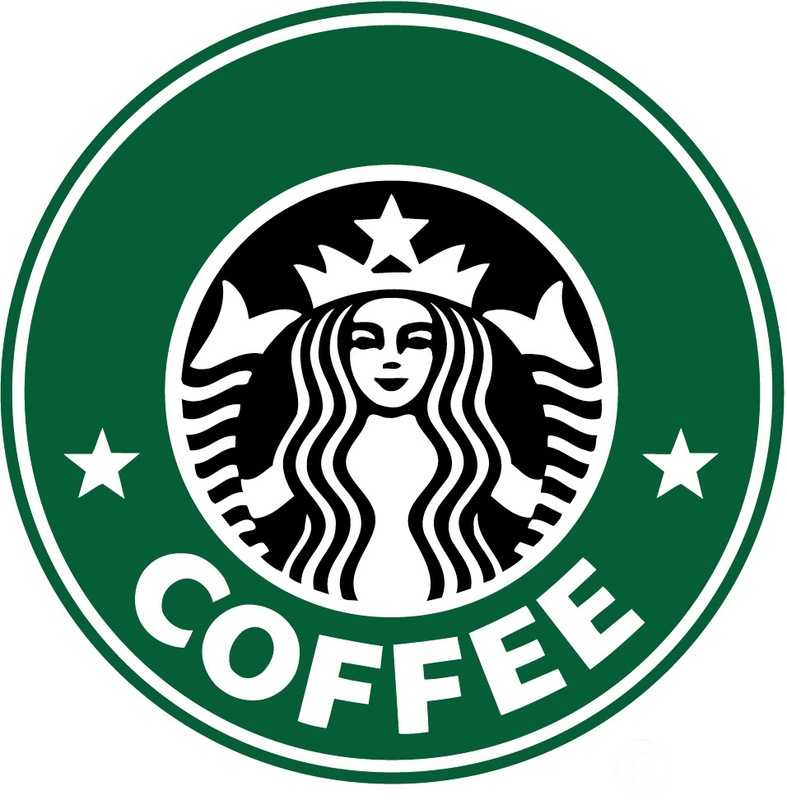 I took the Starbucks image off the net, edited it in Pixlr advanced to remove the Starbucks part. Then I went into Pixlr Express, and added the name that way. The font is Candal, under the Sans Category. I did have to do one letter at a time and line it up just right, which was pain in the rear. It got better the more logo's I did. I made one for each teacher with their first name on it. To make the sticker, I followed this tape transfer DIY. Note: This has to be printed on Laser ink toner. I made the image and then went to Kinko's and had them print it. But they do charge a $5 admin fee? So next time, I'll print it on my computer and then just make a color copy with their laser toner copiers. Also note, I had to use a wider than normal tape. I believe you could find it at an office supply store (Walmart did not have it). But the guy at Kinko's was nice enough to let me use their wide packing tape. Its almost 3 inches. I've also seen it done with contact paper, but it will not stick as well afterwards. 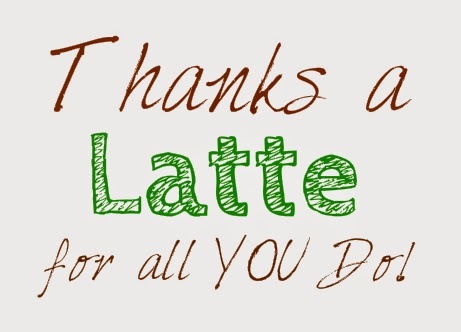 saying "Thanks a Latte for all you do!" 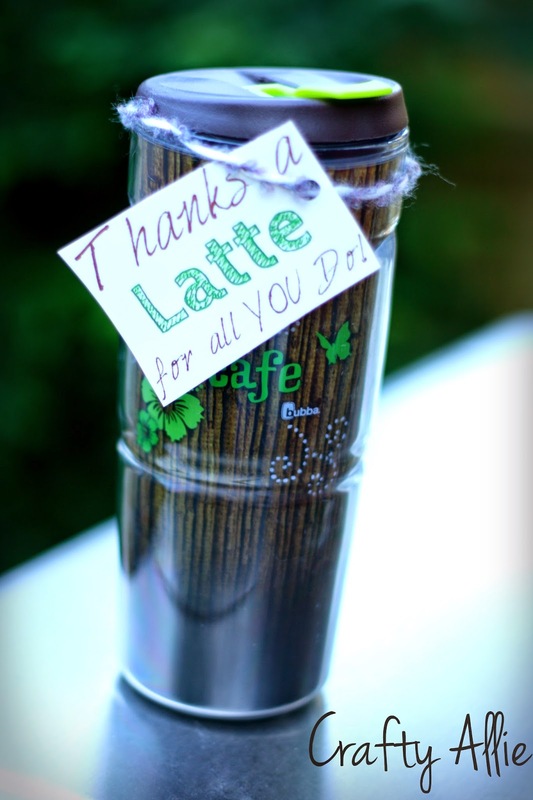 I'll fill it with coffee, and bring it to school one day with the kids for their teachers. It could also be a throw away cup, they have them for like 6 for $1 at the Dollar Tree. 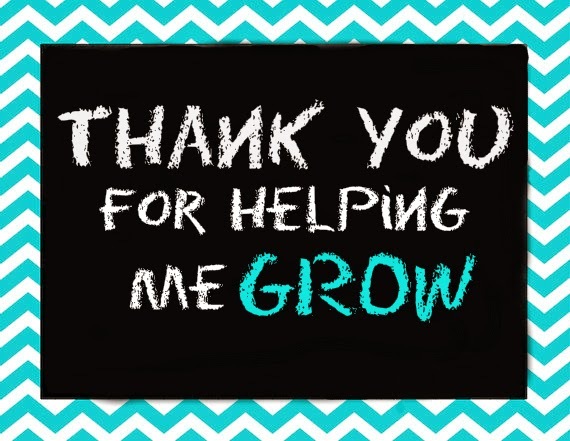 "Thank you for helping grow"
I added it to a chevron back ground and just a black square to resemble a chalk board. Then just get any pretty plant/flower and add the tag to it. I just so happened to have these burlap planters. I bought them for only 30 cents on clearance last year at a local grocery store's floral department. I am so glad I did because they were a perfect accessory to the plants we'll give! "Your the most AW-some teacher". 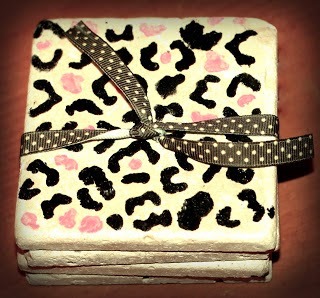 These were a Valentines gift for the kiddo's teachers, but you could make this for their gift this week too. To see the tutorial click here. 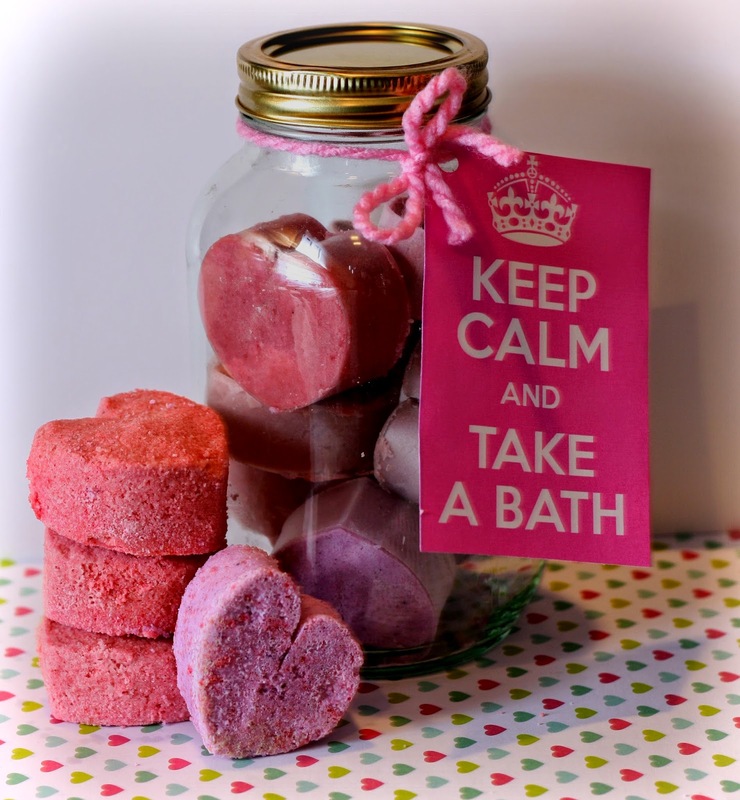 I added the tag "Keep Calm and Take a Bath". I got these cups at the good ole' Dollar Tree. 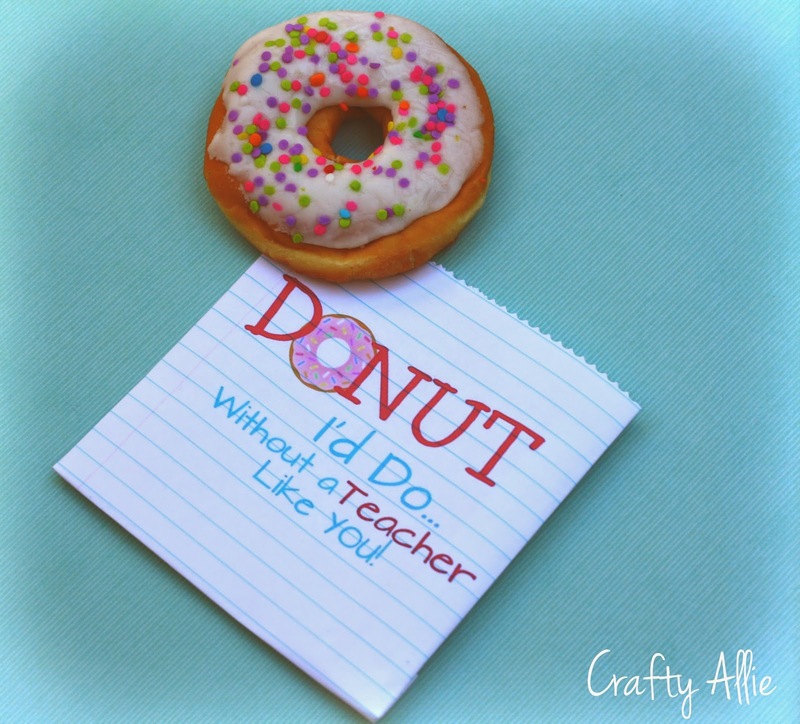 We made these last year for our teachers. They were so easy to make and cheap! Click here to see how we made them. 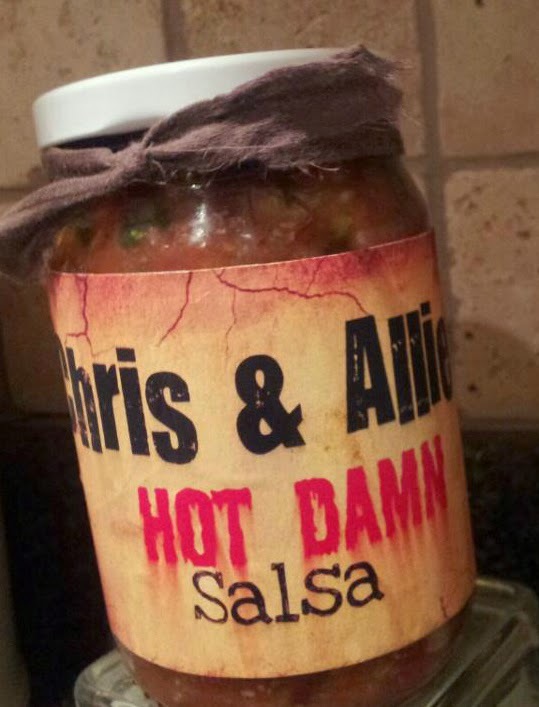 As seen before on 10 Appreciation Gifts from last years post: Homemade Salsa. I can't give you my recipe though. But find one on Pinterest, and then just create a cute label to the jar. Our teacher's loved it and have requested more. We give this out for Christmas, birthdays, and many occasions. I hoped some of these ideas will work for you! Oh almost forgot... to add the tag images. Thanks so much for tuning in guys! 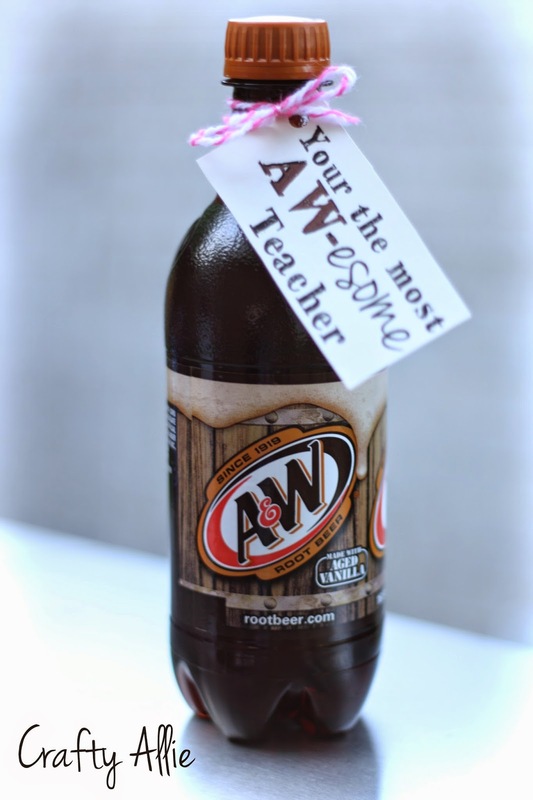 Thank you :) We gave the Root Beer Today, and then it was pointed out by a co-worker who reads my blog that I put Your instead of You're. Oops and I gave it to the teachers. I bet they got a giggle. 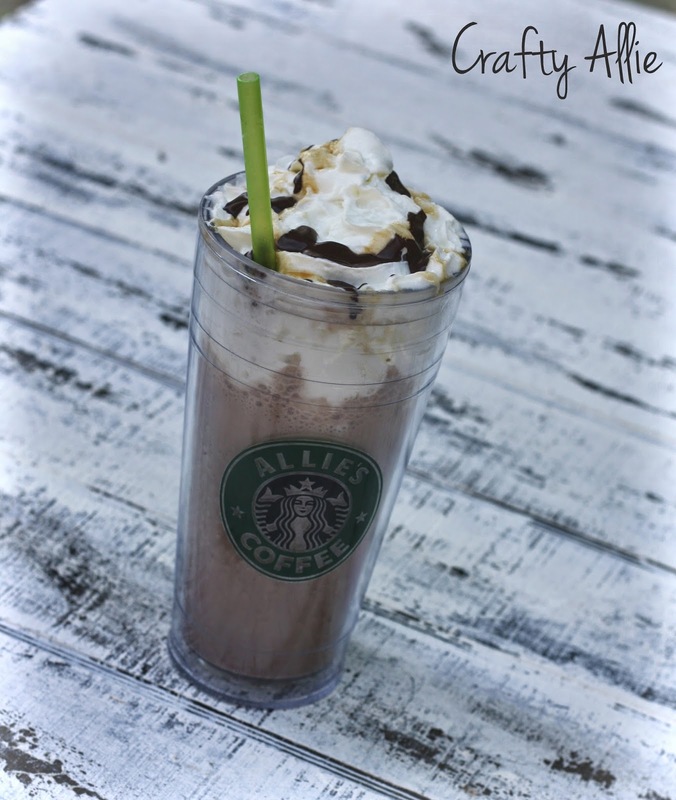 These are great ideas, Allie! Love them! 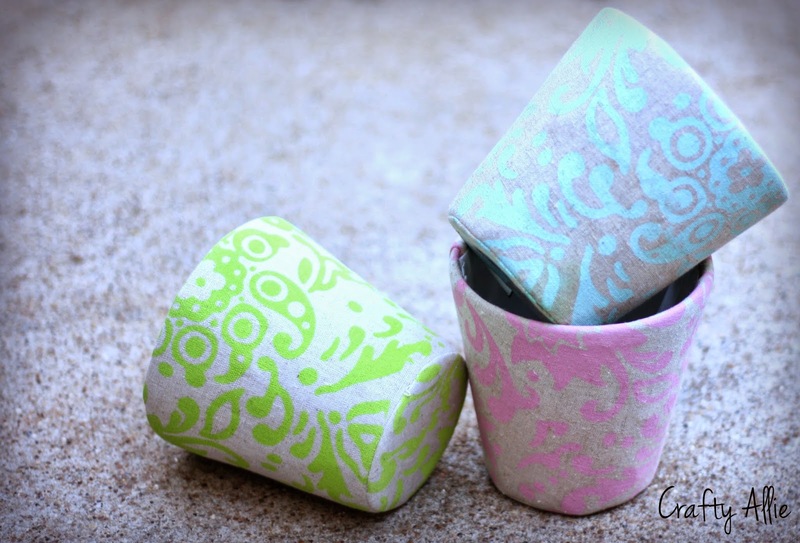 Thanks for including the printables, too! Love all of these ideas. I'll have to keep that A&W one in mind for Friday! Oh, this is a fabulous round up! 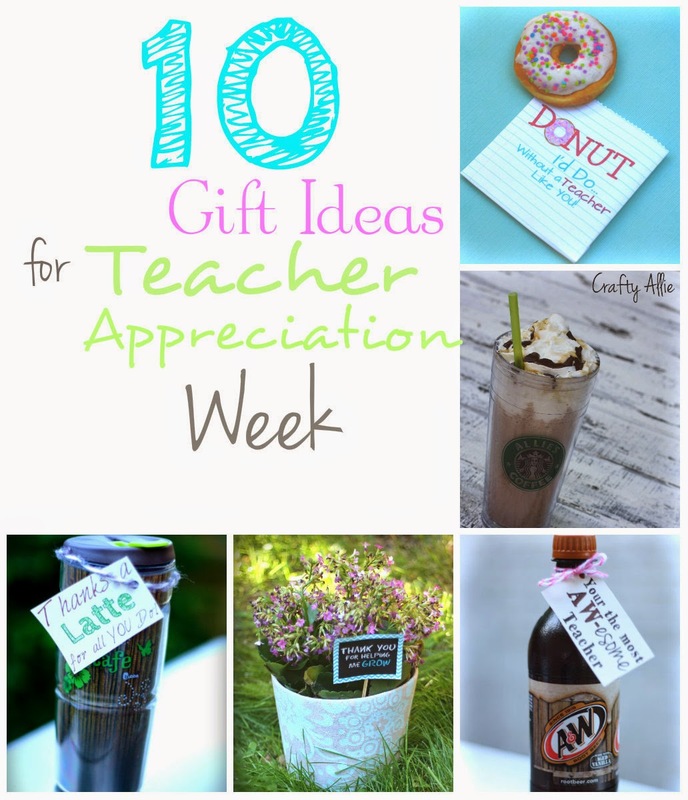 I know quite a few teachers who would love these! 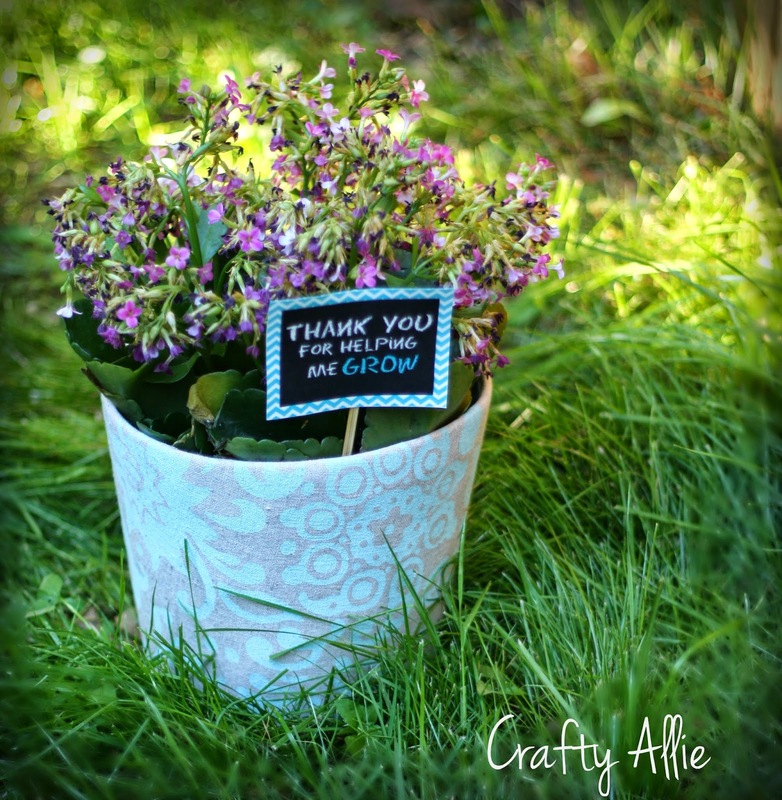 Thanks for linking up at Creative Spark Link Party!